(MoneyWatch) Looking for an affordable place to rent an apartment? Head to the Midwest. Of the 10 cheapest places to rent an apartment across the country, nine are located in the nation's midlands, according to data compiled by ApartmentList.com, an apartment search service. Rent prices across the country average about $1,231 each month, but the median rents in these more affordable places are about half that. In these cities, if you're shelling out $1,200 a month in rent, you're getting a luxury condominium downtown or a lakeside, three-bedroom home with a backyard and a garage. A high-end, one-bedroom, one-bathroom apartment with nearly 800 square feet of living space in the heart of Kansas City, Mo., will run about $1,000 per month, while the same kind of space in San Diego -- the 10th-most-expensive city to rent an apartment in the country -- will cost you around $1,700. Are we becoming a renter nation? Pricey rents in cities like San Diego are being driven by high demand and low supply. But for these 10 most affordable cities, it's the exact opposite scenario. Leasing agents and landlords are hunting down potential renters and trying to wheel them in with updates and perks, said ApartmentList.com CEO John Kobs. The median rents in these 10 cities range from $623 to $730 -- that's a far cry from the nearly $4,000 median rent rate for apartments in San Francisco, which has the distinction of being the most expensive place to rent in the country. Split between Kansas and Missouri, Kansas City has some of the least expensive rental prices in the country -- no matter what side of the border you're on. The median price is $730 per month in the city, which Forbes proclaimed last year has one of the best downtowns. The median rent is $727 per month in Louisville, where plenty of small homes are on the market to rent. The up-and-coming city borders Indiana along the Ohio River and has a vibrant downtown centered amid a hilly, green countryside. The city also has a strong grassroots campaign promoting locally owned businesses with the slogan "Keep Louisville weird." Of the many inexpensive cities to live in Ohio, Columbus is the only one that showed up on the list. The city has emerged as a great place for business and technology, and it's home to Ohio State University, which is the nation's third-largest school by enrollment. The median rent in Columbus is $722 per month. Although Arlington is the smallest city on the list, its location between Fort Worth and Dallas means that it's no small town. The city's claim to fame is its stadiums, which host Dallas Cowboys and Texas Rangers games. It is also the largest city in the U.S. without any kind of public transportation system, so if you rent an apartment here, inquire about parking. The median cost to rent an apartment in Arlington is $713 per month. A mecca for music lovers, particularly Elvis fans, Memphis is a cultural touchstone in Tennessee. Though the city is now second to Nashville in population, its prices are much more reasonable: the median price is $692 per month. Indianapolis is the biggest city on the list, but that doesn't mean it's expensive. The median rental price is $692 a month -- a tie with Memphis. Indianapolis has been attracting young people from around the Midwest as well as nearby Indiana University with its growing job market. With the city now in bankruptcy and services being cut from entire neighborhoods, it's no surprise apartments are cheap in the city. The median rent price is $678 per month, which will get you a modern one-bedroom apartment downtown, now undergoing a bit of revitalization. The median rent in Tulsa is $672 per month -- a small price for a small town. There's a bevy of beautiful apartments on the market in Tulsa, but be careful: The city is located in Tornado Alley and is frequently subject to severe weather. The only city from the Southwest on the list, Tucson is the second-most-affordable city in the country to rent an apartment. 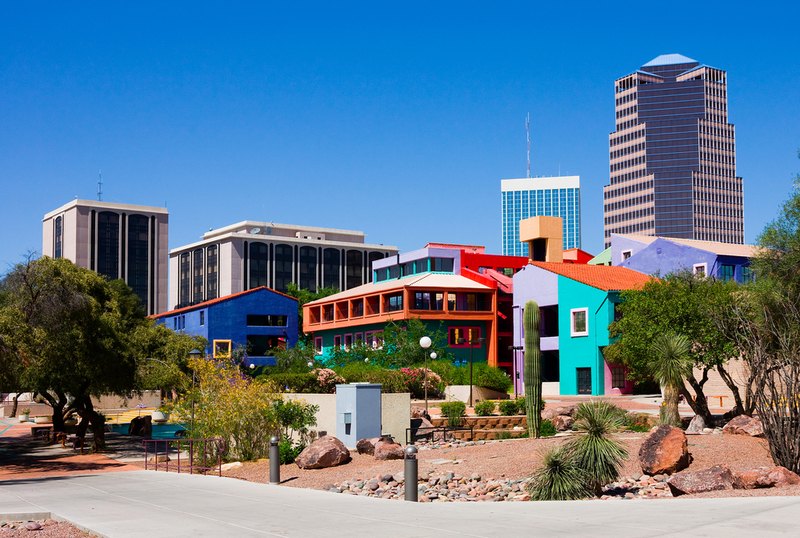 Its colorful buildings are propped up against the Santa Catalina Mountains, making it a unique location. The median rental price is $628 per month. Wichita, located along the Arkansas River, edges out Tucson by just a few bucks. The median rent price in Wichita is only $623 per month. Even two-bedroom apartments are inexpensive, with a median price of only $650. More than 50 aviation businesses operate in the Wichita area, where thousands of airplane parts are manufactured each year.